Usenet provider Giganews has a lot to offer, but just how good is it? We take an in-depth and up-to-date review of Giganews. Let's examine Giganews' claim of being the world's best Usenet provider. Giganews has been and remains one of the most respected Usenet providers on the scene. And by the way, it's Giganews (all one word) and not "Giga news"! Giganews officially opened its news servers to the world in the summer of 1998, over 20 years ago. That makes Giganews older than online giants such as Facebook, Twitter, YouTube and even Google. Their service has spread around the world, serving millions of users in nearly a dozen languages. 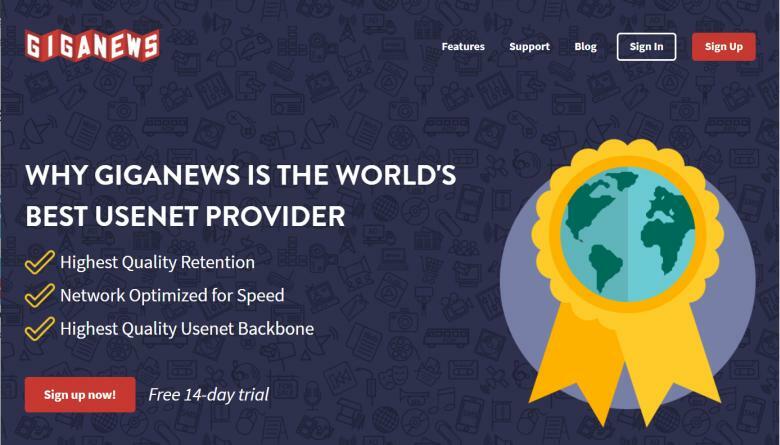 That all sounds good, but is Giganews "the best" Usenet provider? Let's find out. Giganews offers not 1, not 3, but 5 different plans to choose from, ranging from $5 to $22 per month. Let’s take a look at what you can expect. As you can see, Giganews has an option for every type of budget and Usenet downloader, from the max-your-connection Diamond plan to the beginner Pearl plan. Giganews' free trial is available for all of its Usenet accounts. “Try it before you buy it” is always a good idea, especially when at no cost. And Giganews makes that easy with their 14-day free trial offer on all accounts. 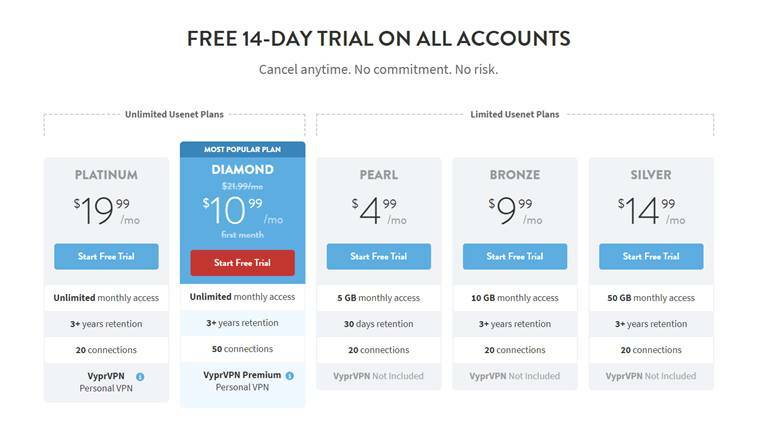 You won’t be getting the full Diamond plan experience (including VyprVPN - a no-log VPN service) during the trial period, but it’s still a great way for savvy shoppers to give the service a spin for shelling out their hard-earned cash. Giganews does plenty of things right, from their download speeds to their customer service. We’re going to highlight some of our favorites here. All Giganews’ plans feature fast download speeds thanks to optimized servers around the world as well as full 256-bit SSL encryption, which keeps your downloads private. Giganews’ famous 24/7 customer support will help you with any snags you might encounter, whether during initial setup or usage. But Giganews doesn’t just provide Usenet. Their Platinum and Diamond packages also come with the zero-logging VyprVPN included in the price. When it’s all said and done, Giganews offers the most complete package you’ll find from a Usenet service. It gives you everything you need to find and download the files you want, all while maintaining your privacy in the process. If you’re the kind of person who places a premium on simplicity, that can be a huge bonus. Giganews’ plans offer 20 simultaneous connections, which is very solid. That puts them right on par with most of the other Usenet providers on the market. But their Diamond package is where they really separate themselves from the pack, with a whopping 50 connections. That’s more than you can get almost anywhere else. The best part is, those connections are fast. Giganews can handle pretty much anything you and your Internet connection throw at it, with their unlimited speeds. And with four servers spread across both Europe and North America, your data won’t have to travel halfway across the world just to get to you. Take full advantage of Giganews' collection of 120,000+ newsgroups, all completely uncensored. To see for yourself whether Giganews carries the newsgroups you are looking for, search or browse its full newsgroup listing. Giganews search lets you hunt through its newsgroup list in full. One of the biggest advantages of Usenet vs torrents and Usenet vs data lockers is the increased privacy that Usenet provides. With Usenet, your IP and identity are more protected. Giganews provides safe SSL connections with all its packages at no extra cost. This protects you against your ISP or other snoops from seeing what you are downloading from Usenet newsgroups. Giganews also includes a VyprVPN plan for free with its premium Usenet packages (Platinum and Diamond). If you don’t already have a VPN account and Usenet provider, the combination of Giganews and VyprVPN is a great one at a good price. And when it comes to VPNs, VyprVPN is one of the stand-out VPN services. VyprVPN is a completely no-log VPN (which was backed up by an independent audit), fast, torrent-friendly and based in privacy-friendly Switzerland outside the USA & EU. For more information about this VPN service, read our full VyprVPN review. As we mentioned before, Giganews was founded more than 20 years ago and has had a consistent track record of reliability as a Usenet provider ever since. They’ve been around longer than many of the biggest names in Usenet, meaning they’ve got serious staying power. And Giganews also boast great stability on a day-to-day basis, promising 100% uptime. Giganews is able to promise more than most Usenet providers because they own their own servers (rather than lease them) and wrote their own news server software. At 1,100+ days (3+ years) of binary retention and 15+ years of text retention, Giganews' retention rates are good. But they used to be much higher - just under 9 years' worth of Usenet binaries and 18½ years of text posts. Unfortunately, Giganews recently reduced its retention rates, but the current 1100 days is more than enough for most people, especially if you are mostly interested in new title releases. Giganews goes above and beyond when it comes to customer service, offering 24/7, round-the-clock support. If you run into a problem, just hop over to their live chat system and give ‘em a shout. They boast the ability to answer most queries in 10 minutes. They also have a collection of Usenet tutorial videos they call Giganews Usenet University. And since their brand serves 180 different countries, they even offer customer service in 10 different languages, including English, Spanish and even Chinese. Here's the Giganews setup & configuration information you'll need to enter into your Usenet newsreader client or NZB downloader software. Authentication: authentication is required so look for a check box such as "Required" or "Authentication Required"
While we have plenty of good things to say about Giganews, no Usenet newsgroup provider is perfect – and Giganews is no exception. Here’s what we don’t like so much. Though you can get some good deals on their Diamond plan, it’s base price of $22 per month is more expensive than the majority of Usenet providers on the market. Keep in mind that you are getting a good VPN along with it, which helps offset some of the sticker shock. But if you’re on a strict budget or don’t do a ton of downloading, Giganews’ most expensive plans may be a little rich for your blood. Of course, they do offer several more affordable options, starting with the Pearl plan at just $4.99/month. But your access and connections will be limited, and you won’t be getting the VPN. In the end, we think Giganews is definitely worth it. In fact, the price tag is one of the only negative things we can say about it. But we understand that cost can be a sticking point for many users, so it’s definitely something to keep in mind. One of their 5 packages will surely fit your budget. Top Tip – Though well worth the price, if Giganews’ Diamond package is outside your budget, opt for their less expensive but still solid plans or check out a different, more competitively priced all-rounder Usenet provider like Newshosting for $7.50/month. Related: Newshosting vs Giganews: Which Should You Choose? While most people probably won’t consider this a “must-have”, it’s definitely a nice feature for the privacy conscious consumer, especially avid downloaders of new releases. There are only a handful of Usenet providers that have stepped up to offer Bitcoin or other forms of anonymous payment processing. Unfortunately, Giganews is not one of them. As you can tell by now, Giganews excels in a lot of areas, from download speeds to customer service to stability. It’s definitely earned its stellar reputation. It’s truly a full-service Usenet provider that does everything you need it to do – and does it well. It’s a great option for new Usenet users, especially if you value convenience and simplicity, and for veteran downloaders who don’t mind paying for a premium service. At Cogipas, our favorite thing about Giganews is probably their great download speeds and completion rates, which help files finish in a flash. Though, like we said, it’s not the most budget friendly option around. But is it worth it? This Giganews review shows that if definitely is if you can afford it. In fact, there are few Usenet providers that can compare to the quality and convenience of Giganews. Give it a try absolutely free for 14 days and see if you agree with our Giganews review.